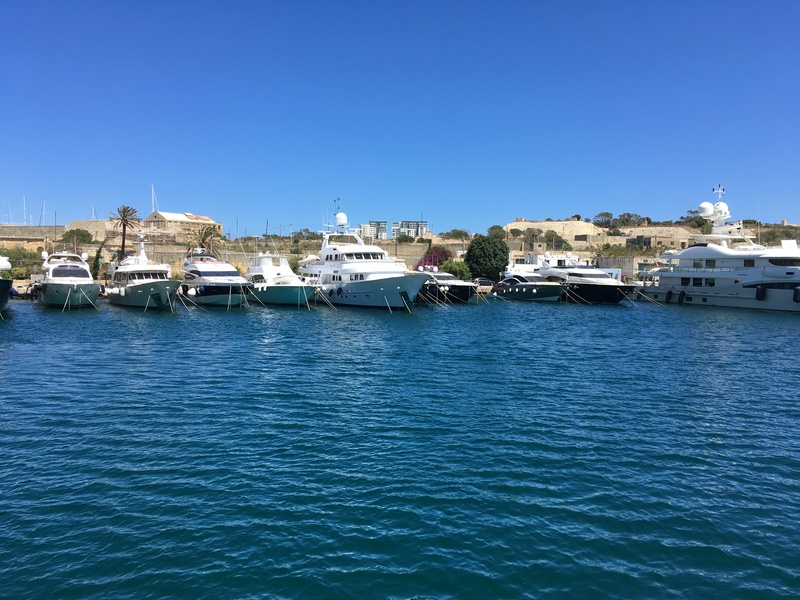 The azure blue sky that made the yachts look like a picture postcard, signalled the arrival of a baking hot day. I dug in the suitcase for a clean pair of loud shorts (Today’s featured beach parasols) rubbed suntan cream on yesterday’s bright red zebra stripes and was ready to start a new day. In what Brits would consider a rather old-fashioned notion everything in Malta is shut on a Sunday. Sweet if slightly inconvenient. With no rush to go anywhere, I decided I wanted to explore the luxury I had found myself surrounded by. Luxury is no new thing to me but luxury on land, definitely new. That pool area alone was almost enough to make me give up the ocean. I say almost because the land has bugs and bugs are evil. But a stretch of water accompanied by an abundance of palm tree’s is just good for a girls soul. Plus, it had my beloved sea view and get this a fake beach! How cool is that! I snapped an abundance of pictures because gotta keep that Instagram popping right!? My parents, my Dad especially is obsessed with walking when we travel. So after I ogled the hotel – We set out to walk from St Julian’s to Silema. We stopped for brunch along the way; brunch must be what European’s do on Sunday’s because it was jam packed. Fuelled, we carried on only to do our usual trick and get lost. St Julian’s to Silema is a straight stretch but we had failed to notice that there is a whopping great underpass you can’t walk through. So we backtracked and hopped on a bus to our final destination. I may be the one who runs a blog and who eat sleeps and breathes all things nautical. But believe me, everyone in my house is as boat obsessed as me. We had noticed that a number of boat tours left Silema and we wanted to catch one. To get our fix of the Mediterranean ocean ahead of our cruise. But the harbour cruise was actually interesting! The commentary discussed all the historical monuments we sailed past and the views were super scenic since Malta is a really attractive place. Plus, I got to stare at some more yachts and I’m sure the previous blog post made it clear just how much I love those. As much as I enjoyed this wee boat trip it does come with two warnings. Wear a lot of suntan cream! Seriously, you don’t realise you are burning because it’s windy. But then you get off the boat and look like a radioactive tomato. If you get sea sick or don’t have vast amounts of experience on boats this may not be for you. There wasn’t a lot of movement in the harbour. But in the open sea, it was rocky verging on a roller coaster. My post-boat plan was to shop in Silema. But they are not kidding when they say everything is shut; it is like Easter Sunday in Britain. So we hopped on a bus back to St Julian’s and repeated the gelato and marina combination. We checked out the options for afternoon tea. But alas Hilton this was the one thing that did not amuse me. I don’t know why everyone in the world appears to have a hatred for plain sandwiches! It makes life so difficult. But I did embrace another pot of tea and a gigantic cookie that was blissful. When we returned to the room we found that today’s towel animal was a dog. Josephine, you were a star! Know that radioactive tomato look I was talking about? Well, I only added to that by spending a couple of hours on the balcony. But I just couldn’t resist! I had found heaven and it was called Hilton; I wanted to soak it all up before I was forced to leave the next day. Malta you weren’t exactly what I had dreamed of…But you were a beautiful disaster! That restored my faith in travelling on land. It is definitely the place to go for a winter escape and I know I’ll be recommending it. Hope everyone enjoyed this mini series if you read all three then comment the tomato emoji. There’s some awesome boat trips to go on around Malta, did you make it over to Gozo?